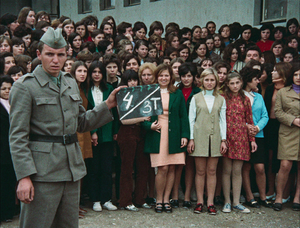 An essential figure of Yugoslav cinema, Karpo Godina infused the radical “Black Wave” of the 1960s with an irrepressible expressive freedom—squarely targeted against all forms of repression—and thrived long after the end of Titoism and the breakup of Yugoslavia in civil war. For more than 30 years, the half-Slovenian, half-Macedonian filmmaker has brought a playfully anarchical spirit to the poetics and politics of film, moving breathlessly between fiction and nonfiction in his avant-garde shorts of the 1960s and ’70s and his feature films of the 1980s and ’90s. Godina makes a rare appearance at MoMA to present his first career retrospective in the US, coinciding with the exhibition Toward a Concrete Utopia: Architecture in Yugoslavia, 1948–1980.